On our way back to the motor home from Old Town, we stopped at Petroglyph National Monument, which is located a few miles north of Albuquerque. Petroglyphs are images that were etched into stone. Petroglyph National Monument protects a variety of natural and cultural sites containing up to 20,000 images that include animals, birds, people, and geometric and other designs. Most of the images were carved by Native Americans, but some were carved by early settlers. 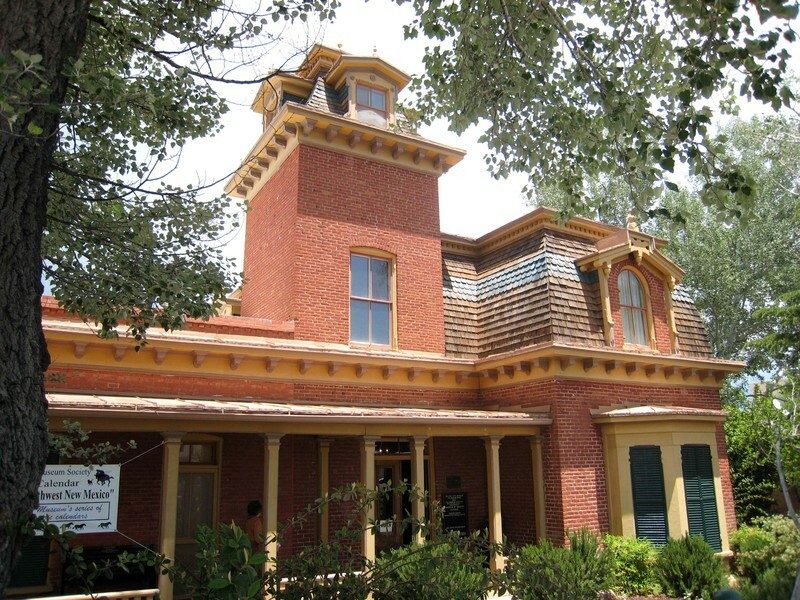 The photo below shows the entrance to the visitor center. Notice the chili pepper ristras hanging from the posts. Paleo-Indians were the first pre-historic inhabitants of the area. Later inhabitants include the Mogollion (pronounced Muggy-YONE) and the Ancestral Puebloans. By the time the Spanish arrived in the 1500s, there were villages of Puebloans, as well as groups of Navajo, Apache, and Ute. The Native American rock etchings at Petroglyph National Monument were probably done 400 to 700 years ago, although some may have be as much as 2000 to 3000 years old. In the 1600s, heirs of Spanish land grant recipients carved crosses and sheep brands into the rocks. In the 1800s, other explorers and settlers also chiseled their names and dates into the rocks. The rock at Petroglyph National Monument is volcanic basalt. The lava flowed from a large crack in the earth's crust to the west. Several cinder cones that formed along this fissure can still be seen at the western edge of the national monument. Exposed rocks in arid regions frequently develop a dark coating called desert varnish. The earlier images in Petroglyph National Monument were made by hammering directly against a stone face or boulder with another stone to chip through the desert varnish to expose the lighter-colored rock below. Later, a technique was developed where one stone was used as a hammer to strike against a second stone, which was used as a chisel. This later method provided better control. There are two hiking trails where petroglyphs can be viewed - a shorter one to the top of the mesa at Boca Negra Canyon (about one hour round trip) and a longer one at Rinconada Canyon (over two hours round trip). There is also a trail at the western edge of the national monument (right up the road from the interstate exit where our campground was located) to the cinder cones. 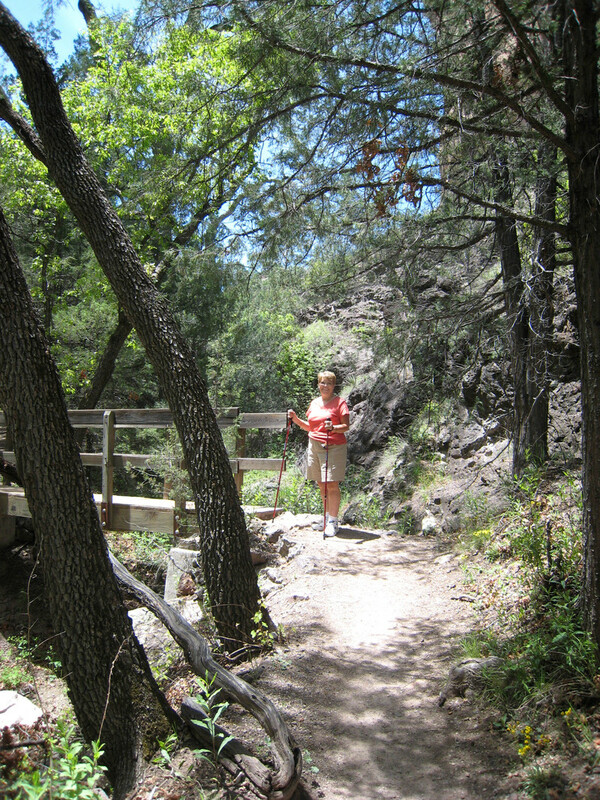 Since it was mid-afternoon, we opted for the shorter trail at Boca Negra Canyon. As we said, this trail involved a climb to the top of the mesa. Margery took off with a pretty big lead after Paul backtracked a hundred yards or so to the car to get the binoculars. The trail was pretty rugged with large boulders and bowling ball-sized loose rocks along the path. We haven't mentioned Margery's knees for a long time because they have been doing so well. This steep, rugged climb was no problem either. There were numerous petroglyphs visible on the way up the trail. The one below is a person with a geometric shape below. Unfortunately, some of the petroglyphs, like the upper left corner of the one shown in the photo below, have had pieces chipped away by vandals, souvenir hunters, or by freezing and thawing. This next petroglyph is starting to fade and has a large crack running across the middle. On the way up the trail, we could see Sandia Peak off to the east with the northern suburbs of Albuquerque in the foreground. We're looking forward to exploring Sandia Peak later in the week. The trail back down to the parking area follows a slightly different path. We saw the petroglyphs in the next photo on the way down the trail. The figures on the left are two birds facing each other. No one really knows what the petroglyphs mean. Did they have religious significance? What was their message? Were they art? Were they someone's way of saying "I was here" or "This is my territory?" Or were they just ancient graffiti? We'll probably never know. Back down in the parking area, Paul noticed curly dock growing in various locations. Although it is a difficult-to-control weed in the lawn or garden, the plant is fairly attractive in this desert setting. Curly dock, which is sometimes called wild rhubarb, is also edible. From Petroglyph National Monument, it was only a short distance back to the motor home where we had dinner and relaxed for the evening. 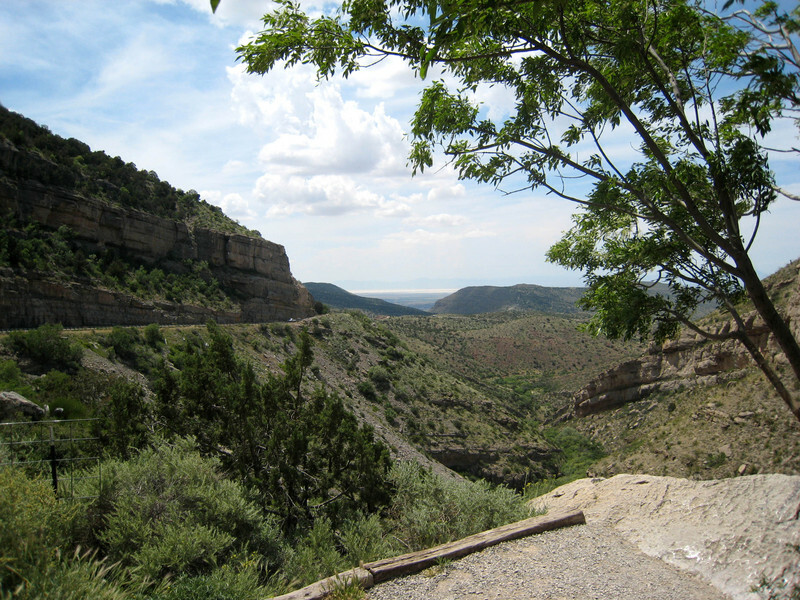 There is a lot to do and see in the Albuquerque area, so check back to see what else we're up to. We try to travel on Mondays or Thursdays. We LOVE to sit around on Sundays, watching the NASCAR race and saying goodbye to the weekend warriors as they pull out. It wasn't that long ago when WE were weekend warriors and would say to each other, "If we didn't have to go home, where would you go from here?" Arriving on Thursdays gives us more of a choice of campsites before the campground begins to fill up on Friday. We pulled into Rose Valley RV Ranch in Silver City, NM (elevation 6,000 ft.) on Thursday. As the name suggests, Rose Valley RV Ranch has a western theme. 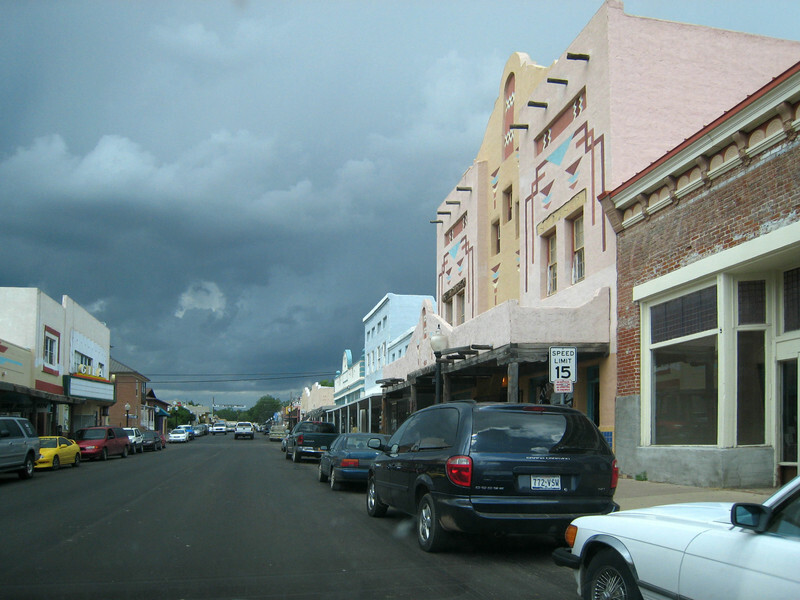 The office and shower buildings are designed to look somewhat like storefronts from the Old West. There is a wooden water tower and old pieces of farm and ranch equipment sitting in some of the open spaces between sites. Although Rose Valley has some of the widest campsites we've seen at a private campground (most sites were at least 50' wide), there were also strategically-placed fences made from old barn wood and corrugated metal between sites. In addition to adding to the privacy, the fences also added to the rustic atmosphere. The campground is pretty quiet, although there was some minor traffic noise from US 180 (the main route into town) and from weed-whackers from the neighboring cemetery. When we arrived in Silver City we were faced with hydraulic jack failure for a third time. This time the problem was the same as the first - one jack would not go down. From troubleshooting the previous failures, Paul could tell it was another burned out solenoid, the same as the cause of the first problem and a relatively complicated fix. A call to the manufacturer (HWH. Corp.) resulted in a very quick callback from someone who obviously had more authority than the usual tech reps that had assisted with the problems before. The person who called back was very upset that this was the third problem with their system and proposed replacement of all 4 solenoids as well as both rear jacks (all still under warranty). He went so far as to call ahead to our next stop and help schedule an appointment with a mobile repair service that would come to us. He would also air ship the parts. Although we were disappointed with a third jack failure, HWH really stepped up to the plate to try to remedy the situation once and for all. We were looking forward to what was, hopefully, going to be the final fix. 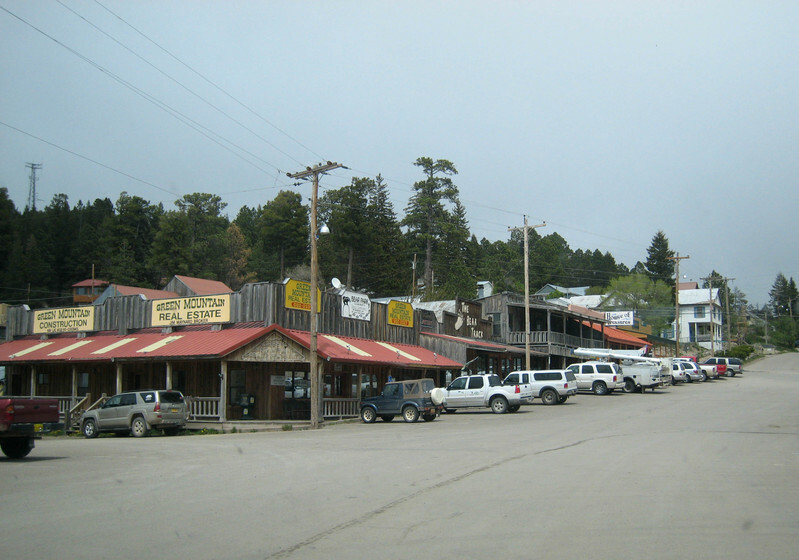 Silver City, bordering on the Continental Divide, was founded as a silver mining town. A tent city sprang up in 1870 with the discovery of silver nearby. Within a year, over 80 buildings had been constructed. Butch Cassidy and his gang spent time in Silver City and worked at a nearby ranch between robberies. Billy the Kid spent his early years in Silver City. We have found small, local museums to be very interesting, well-done, and worth the time. Silver City's museum, shown below, was no different. We had read about the 55-foot-deep canyon that runs right through town. Between 1895 and 1906, floods gutted Main Street creating what is call the "Big Ditch." Margery was looking forward to seeing the effect this had on the town, turning some of the downtown buildings bass-ackwards: the storefronts--once facing Main Street--now face the ditch with access from the backside. However, as often occurs, things rarely look like what we imagine from a written description. Although it is now one of the strangest municipal parks ever created with picnic tables, walkways, and bridges in this deep arroyo, the "Big Ditch" was a disappointment...not at all what Margery had imagined. In fact, there are so many trees, it is hard to see the ditch at all. The main street of the downtown area has now moved one street to the west and the buildings have been either rebuilt or totally remodeled. The main street looks much like any Victorian/Southwest town of old. The "Big Ditch" is immediately behind the buildings to the right in the photo below. On our way in to Silver City we passed an open-pit copper mine. This area is in the heart of the Central Mining District of New Mexico. 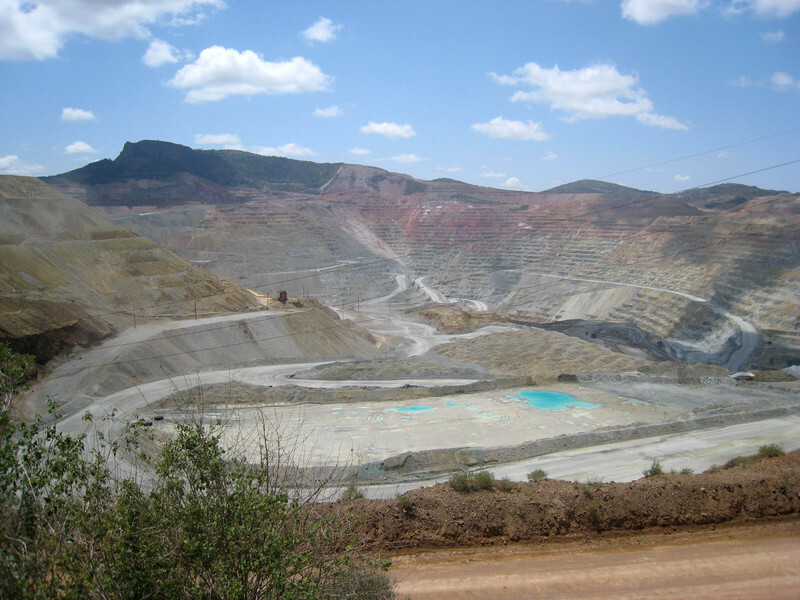 There are several open-pit mines in the area, but the nearby Santa Rita Mine is one of the largest in the world. The Santa Rita Mine is owned by Phelps-Dodge and the pit is almost 1,500 feet deep and over a mile across. The photo below is from an observation point overlooking the pit. From the earliest times the area attracted Native Americans who used naturally-occurring copper for ornaments, tools, and weapons. In the early 1800's the Spanish mined copper in this area and in 1853 ownership passed from Mexico to the United States as part of the Gadsden Purchase. The early copper and silver mines were underground mines, but open-pit copper mining began in the early 1900's. Higher-grade copper ore is treated in a concentrator. The rock is crushed and processed from the naturally-occurring 0.6% copper to 25%. The concentrate is shipped by rail to a smelter in Arizona. Low-grade ore is treated by a solution-extraction-electroplating process. A weak acid solution is dripped through the ore and dissolves the copper. An electric current is then passed through the solution and the copper is electro-plated onto plates called cathodes. One of the major problems with open-pit mining is all the over-burden that must be removed to get at the ore. Since 1910, more than 2 billion tons of material have been moved. 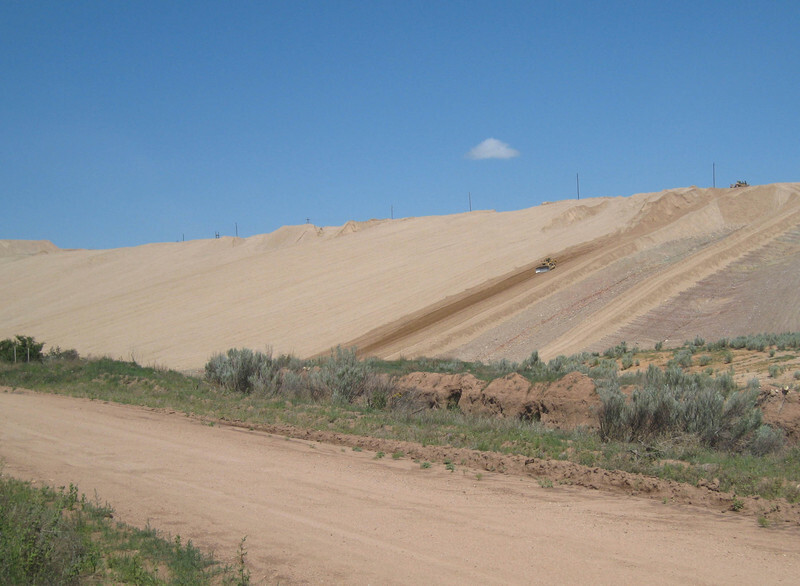 The over-burden is stockpiled along with tailings (what remains after the ore is processed to remove copper). Phelps-Dodge has begun aggressive reclamation work at the nearby Tyrone mine. They are redistributing stockpiles, constructing water-control channels, capping the area with soil, and mulching and seeding. They plan to move the reclamation project to the Santa Rita Mine in 2008. About 40 miles north of Silver City is Gila Cliff Dwellings National Monument. The Gila Cliff Dwellings are surrounded by the Gila National Forest and are on the edge of the Gila Wilderness. The Gila Wilderness is the nation's first wilderness area. The wilderness designation means the area will not be altered by the intrusion of roads or other evidence of human presence. 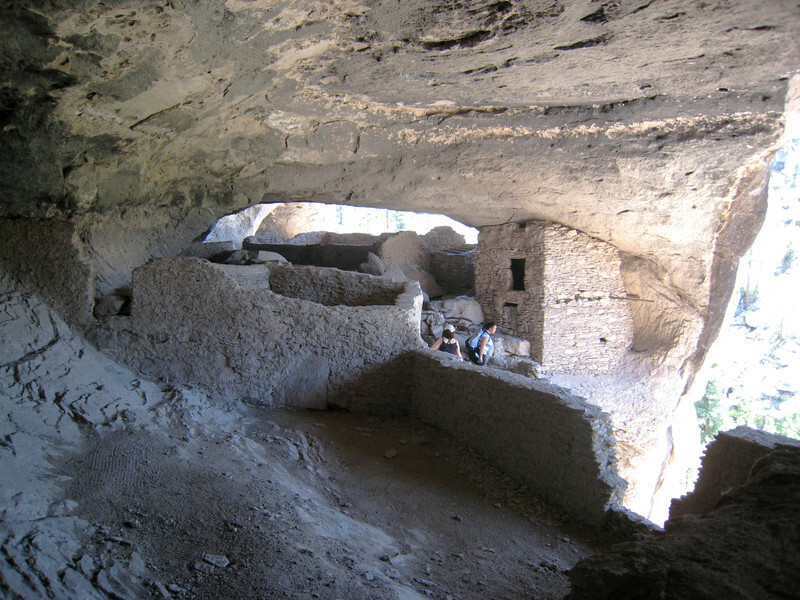 The Gila Cliff Dwellings are said to have been the home of a band of 40 to 60 Mogollon (pronounced muggy-own or moe-go-yone), an agricultural and deeply religious people from about 1280 to the early 1300's. There are 7 caves in the face of the cliff, but only 6 have evidence of human activity. The 7th is small and fairly inaccessible. In the caves are one and two-story stone structures. It was a one-mile round trip up the path to the dwellings. Once again Margery was a trooper and made the hike up and back using the trekking poles. And here we both are resting during the climb. There's so much that we're not able to see because of the hike required to reach those off-the-beaten-path locales. However, it seems a mile is doable and maybe even farther if the trip is more level. The volunteer interpreter at the entrance to the dwellings was interesting. After over 5 years of research and interpretation, he advanced the theory that these and other so-called cliff dwellings were not really dwellings at all, but were actually purely ceremonial sites. The Mogollon were agricultural and usually lived near riverbanks. Although the cliff would have provided good protection, the riverbank would have been a more logical choice for daily living and there is evidence of habitation from this time period along the nearby Gila River. Whether the Mogollon actually lived in the cliffs or on the banks of the river, they were attracted to this area by the reliable water supply of the Gila River. No one knows why they left. See Photo Album 018: New Mexico II for more pictures of the Gila Cliff dwellings and the Gila National Forest. After a week in Silver City we moved on to Elephant Butte State Park at Elephant Butte Lake near Truth or Consequences, NM. Elephant Butte Lake is named for a butte that is said to look like an elephant. The butte is now in the middle of the lake which was created by a dam constructed across the Rio Grande River in 1916. The lake is about 40 miles long and has over 200 miles of shoreline. It is the largest lake in New Mexico. The campsites are spacious and most have at least a partial view of the lake, although the lake is quite far from most of the developed RV sites. Elephant Butte State Park is a very popular park, as we found out since we were there over Memorial Day weekend. The park was fairly quiet when we arrived on Thursday and again on Tuesday after the holiday, but it was a zoo over the weekend. Being the largest lake in New Mexico and being relatively close to Las Cruces, NM, Albuquerque, NM, and even El Paso, TX, it attracts large crowds. In addition to the developed campsites, dry camping is permitted on the beach. RVs were lined up end-to-end along the beach and tents were crammed in wherever they would fit. Even in the designated RV sites there were multiple families sharing sites. The 2 sites in front of us had 2 RVs (one on each site), 5 tents, at least 5 or 6 vehicles (it was hard to tell because they kept coming and going), at least 15 people (they kept coming and going, too), at least one motorboat, and one large pontoon boat. They left the pontoon boat in the water most of the weekend. That way they could use the trailer as a drying rack for all their towels and wet bathing suits. We were glad to see the holiday end. The town of Truth or Consequences, NM (T or C for short) was named for the radio (and later TV) game show of the same name. In 1950 on the 10th anniversary of the Truth or Consequences radio program, radio and TV producer Ralph Edwards (1913-2005) said he wished some town liked the game show enough to change its name to Truth or Consequences. Hot Springs, NM (as it was known then) heard Ralph's proposal and decided in a special election (1,294 for, 295 against) to change its name to try to take advantage of the publicity to increase its tourist activity. For many years, Ralph Edwards and his Hollywood friends came back to T or C to celebrate the anniversary of the name change. The mobile RV repair service showed up bright and early the morning after we arrived and completed the repairs to our jacks in a little over 2 hours. The jacks now work better than when they were new, so we hope this is the end of the story on the jacks. 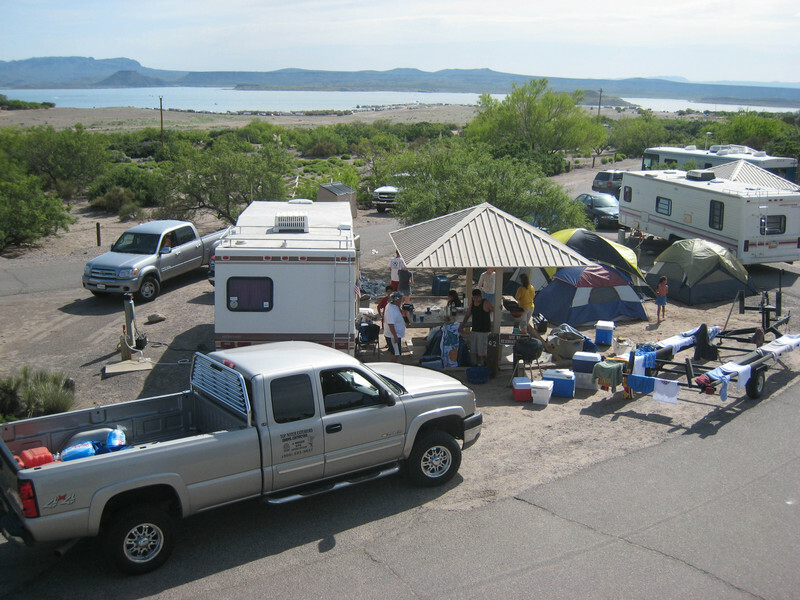 We spent our time at Elephant Butte working on some projects around the motor home and relaxing. 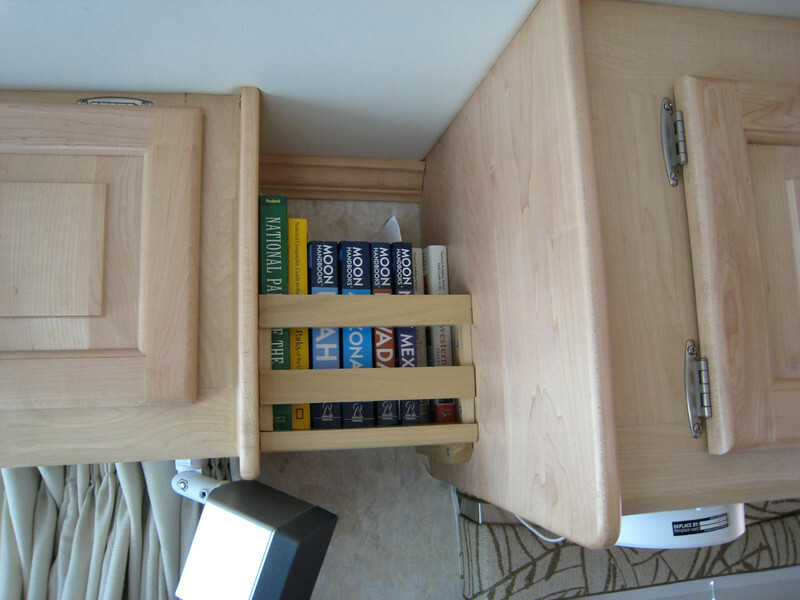 Paul built a small bookshelf to take advantage of some unused space between two cabinets in the motor home. He also climbed up on the roof and cleaned the outside of the vent covers. The other thing we did was to work on our itinerary for the summer. Margery plotted a number of possible travel routes, calculated travel times, and researched possible campgrounds. For the near term, we will be heading for the Grand Canyon and will then tour southern Utah and Colorado. Our next stop was Bluewater Lake State Park located about halfway between Grants, NM and Gallup, NM. The campground is fairly remote with 30 amp electricity on only 14 out of 149 campsites. Bluewater Lake is a relatively small lake, although they say you can water ski. The campground filled up on the weekend, but we didn't see many with boats. All in all, it's relatively quiet and not a bad spot for a stopover. Some of the sites could use a little fresh gravel and fewer weeds. Most of the sites and the interior roads are lined with large rocks so you need to be careful backing and maneuvering some of the tighter turns. There are several Native American sites and pueblo ruins in the area, but they are a fair drive from Bluewater Lake so we decided to just spend our time relaxing and enjoying the clear New Mexico skies. Our next stop will be Flagstaff, AZ. We're meeting family to explore the Grand Canyon and Sedona area together. We had spent almost three months in Texas, and it was time to leave Kerrville and the Texas Hill Country and head for New Mexico. We headed west on I10. Not too far off I10 in west Texas is Davis Mountains State Park where we stayed back in February. We liked the stark beauty of the area and the remote, peaceful feeling of the park, so we stopped again on our way back west . Paul was sick the whole week we were there. However, he didn't have to go to work, could nap when he wanted, and had the beautiful Davis Mountains for a view. Things could have been worse. :) We decided to skip traveling to Big Bend National Park this trip and stay put for the week. 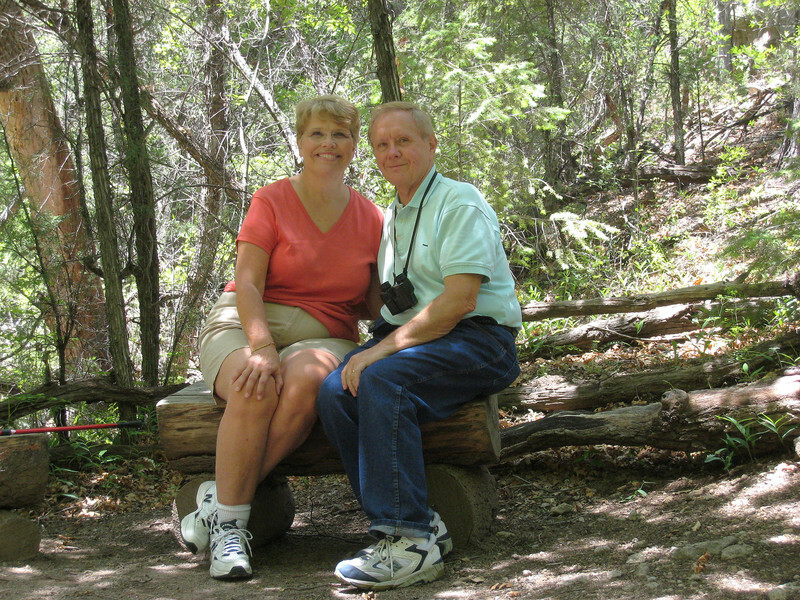 When Paul was feeling better, we headed about 35 miles north to Balmorhea State Park. The campground consists of pull-through sites with 50 amp, back-in sites with 30 amp, and tent sites with water only. We opted for a 30 amp back-in site because we thought the views and privacy were better than the pull-throughs. 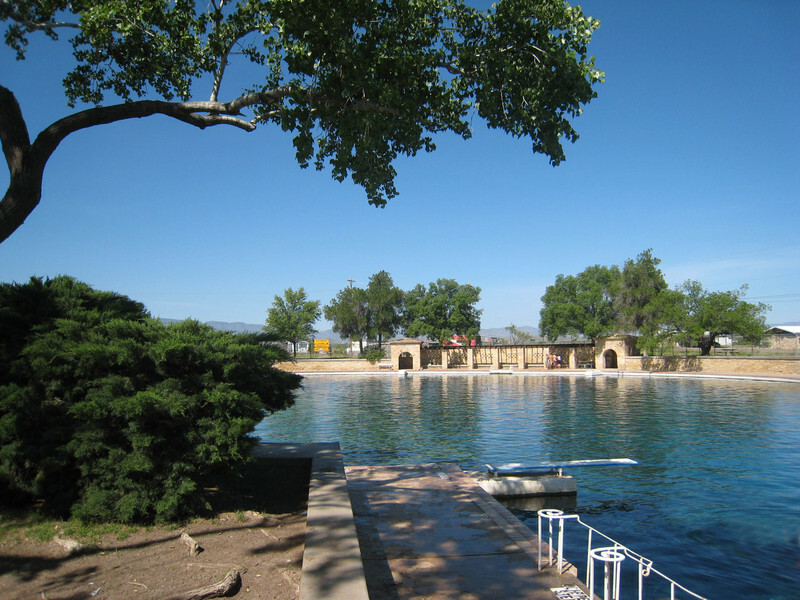 Balmorhea State Park is built around San Solomon Springs. Water for the spring comes from an underground aquifer and flows at the rate of about a million gallons an hour. Native Americans and early settlers used the springs for crops and irrigation. In the 1930's, the CCC built the state park which includes a 77,000 square foot swimming pool which is popular with scuba divers. The end where the spring is located (to the right and to the rear in the photo below) is 20' deep. Today the area also includes a reconstructed desert wetlands and a canal which are the home to several species of endangered fish. From the wetlands and canal, the water flows to irrigation canals and to Balmorhea Lake. Our stay at Brantley Lake State Park was our first experience with the New Mexico State Park System. Brantley Lake is along the Pecos River just north of Carlsbad and at the northern edge of the Chihuahuan Desert. The sites are widely spaced, although some of the parking pads are short and could only be used by tenters. All sites have covered picnic tables. There are 3 sites with sewer hook-up. 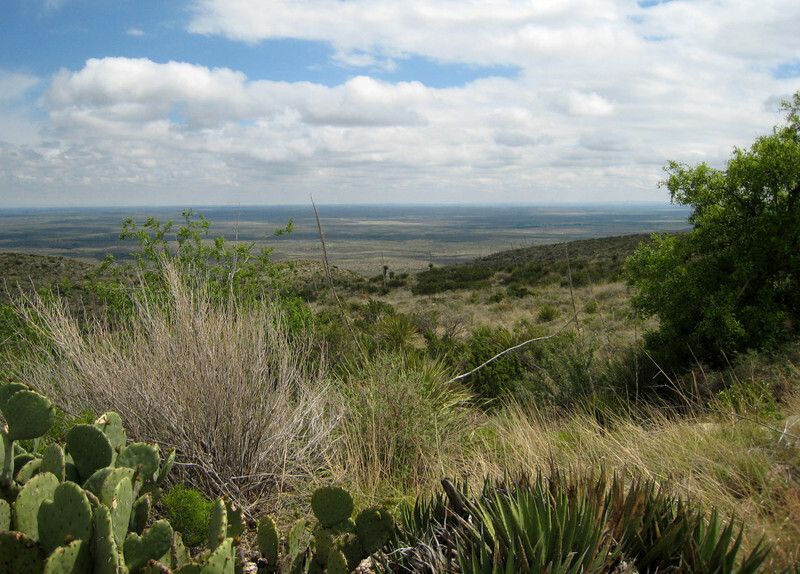 South of Carlsbad is Carlsbad Caverns National Park. 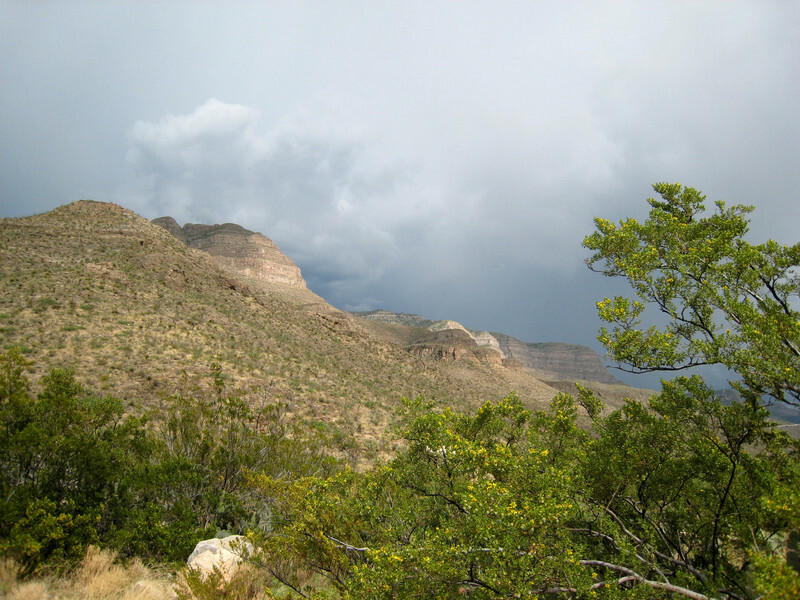 The park contains over 33,000 acres of rugged, Guadalupe Mountain wilderness. This is the view from the back side of the mountain where the Visitor Center is located. 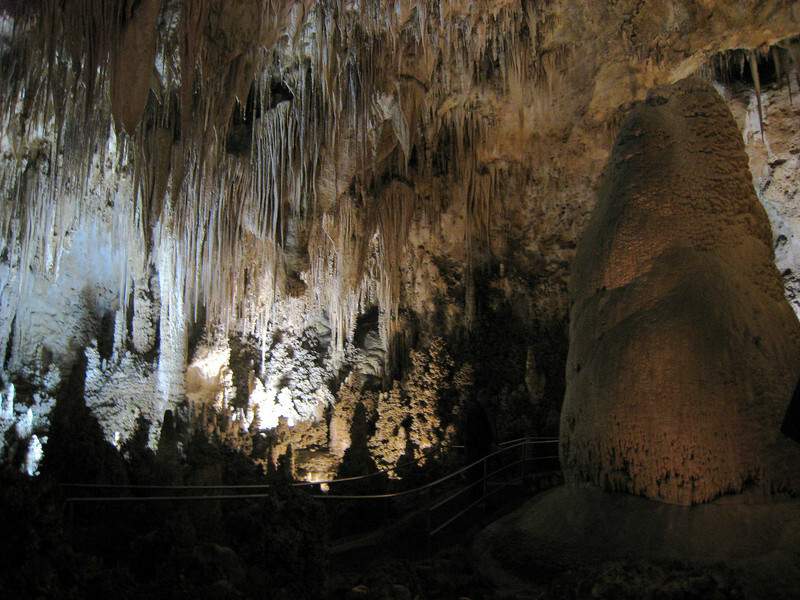 Carlsbad Caverns are said to be the most beautiful caverns in the world, and it's not difficult to see why. Inside the cave there are formations almost everywhere. Lighting is low-key and was done by theatrical lighting professionals. Although the lighting sometimes takes on different hues in photographs, it is all done in natural colors. Stalagmites tower up to 60 feet from the floor and stalactites - some massive, some broadly conical, some delicately slender - hang from the ceiling. Sometimes stalagmites and stalactites meet to form a continuous column from floor to ceiling. There are even delicate stalactites called soda straws that are actually slender, hollow tubes. With a little imagination, you can see different shapes in the formations, and we had fun pointing them out to each other. See for more of the interesting formations at Carlsbad Caverns. Paul was looking forward to visiting Roswell, NM, about 60 miles north of where we were staying to find out what all the UFO hoopla was about. On July 4, 1947, something crashed in the desert near Roswell. There has been much controversy over exactly what it was that crashed. The official government position is that it was a top-secret weather balloon, but credible reports indicated it might have been something else. 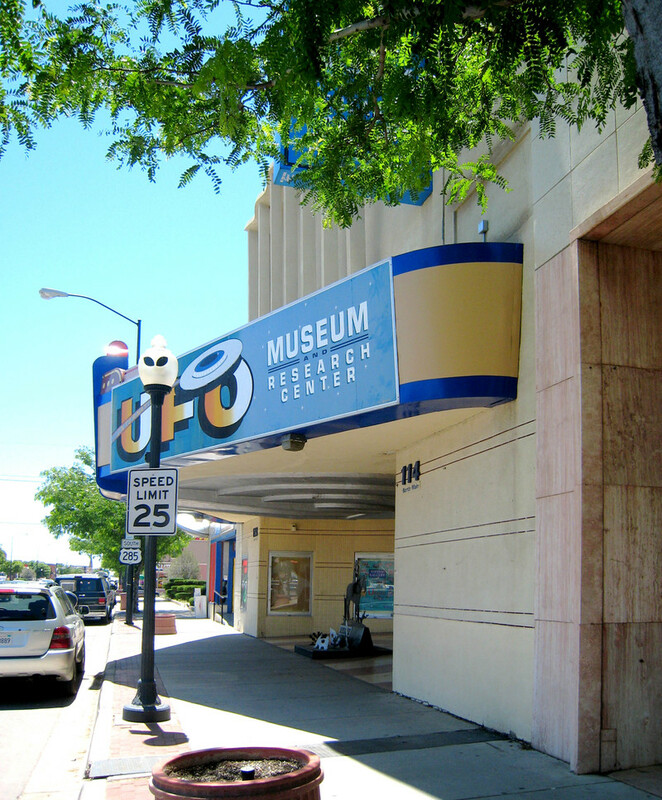 The UFO Museum and Research Center presents information about the so-called Roswell Incident with copies of newspaper articles, government statements, and affidavits from local citizens. The rancher who was the first to find the 300 yard wide by ¾ mile long debris field claims to have collected some of the debris including unusually lightweight metal pieces - some of them which had strange violet-colored markings. A local nurse even claims to have seen the bodies of several of the aliens. The museum presents both sides of the story and more or less allows the visitors to draw their own conclusions. Frankly, we could not reach a conclusion one way or the other, but we found it to be very interesting. ...and the Tularosa Basin to the west. 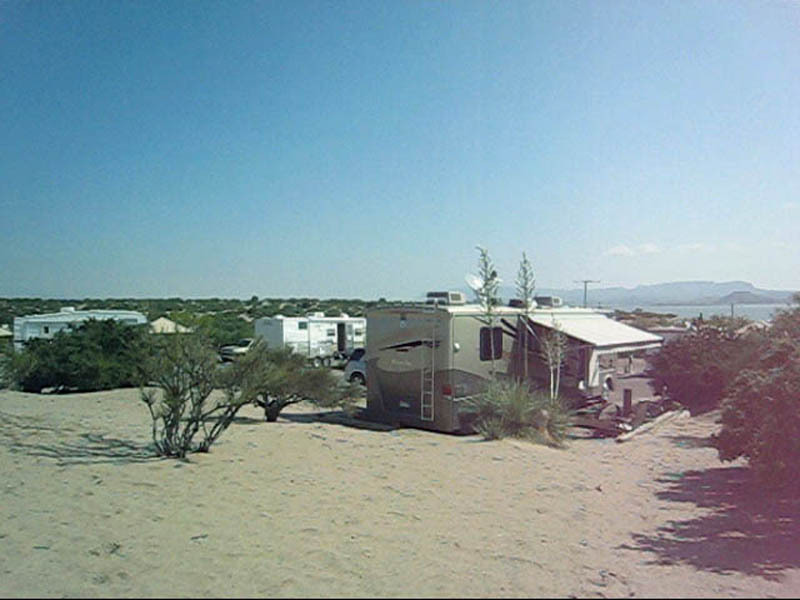 The campsites are widely spaced and surrounded by Chihuahuan Desert vegetation. We were blessed to arrive with spring in full swing with wild flowers, ocotillo, agaves, and cacti in bloom. See Photo Album 017: Caverns to Nuts in New Mexico for photos of the beautiful desert plants. 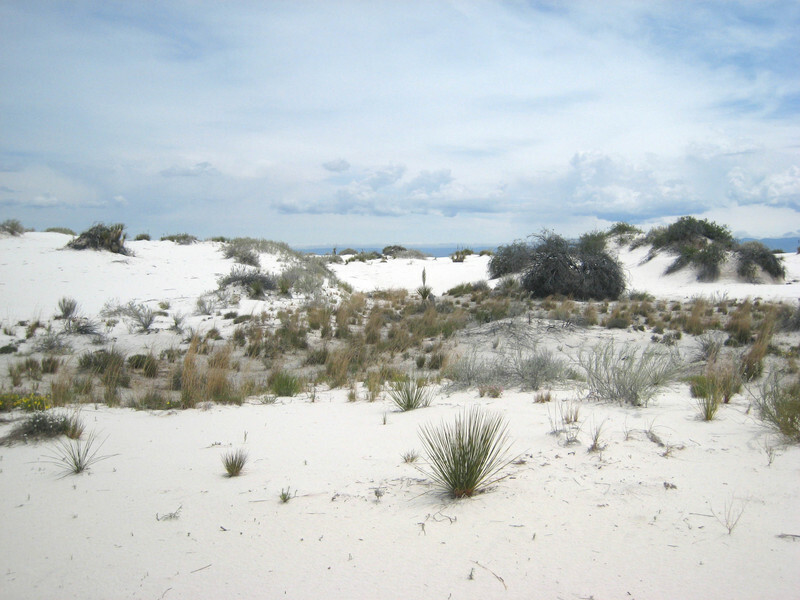 The main reason for going to Alamogordo was to visit White Sands National Monument. The white sand dunes cover 275 square miles, but only a portion of that is the national monument. Most of the remainder is White Sands Missle Range, which is the birthplace of America’s atomic and space programs. 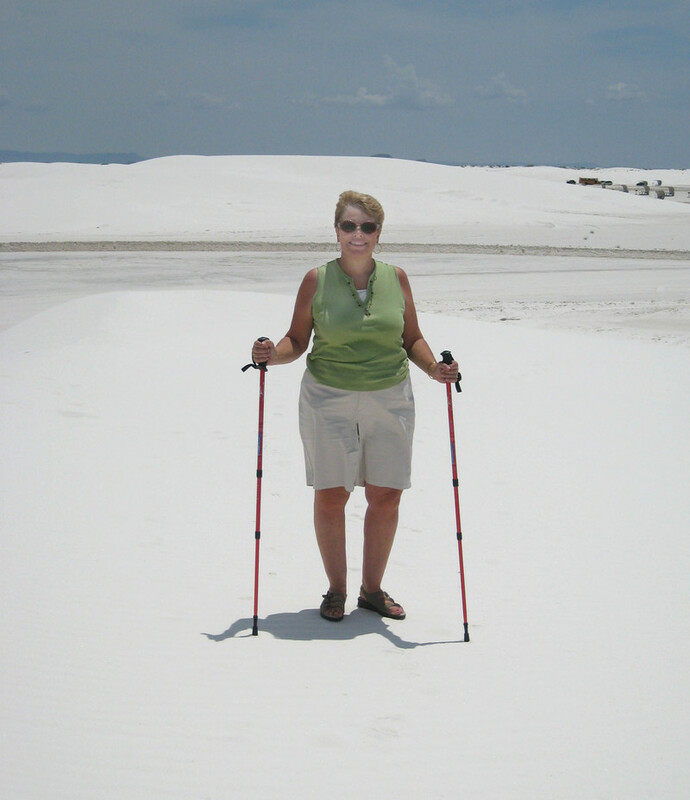 The white sand is actually gypsum, which is a mineral used to make plaster and drywall. Gypsum is contained in the limestone layers in the surrounding mountains and is soluble in water over time. High in the mountains, rain slowly dissolves some of the gypsum. The dissolved gypsum is normally carried by rivers to the ocean, but gypsum that finds its way to the Tularosa Basin is trapped because no rivers drain the basin. During the wet season, water carrying the dissolved gypsum collects in low spots and shallow lakes, the largest of which is Lake Lucero. As the water evaporates, the gypsum forms crystals called selenite. The wind breaks off the soft crystals, and they begin their tumble across the desert becoming grains of sand. The tumbling also produces the scratches on the surface of the grains which changes the appearance from clear to white. Because of the arid conditions in the basin, the gypsum does not re-dissolve. The sand dunes move across the desert like waves on the ocean in ultra slow motion. In areas where the dunes move rapidly (the dunes can move up to 40 feet a year!) there is no vegetation. The moving sand simply smothers anything that tries to grow. These areas reminded us of giant snow drifts. In fact, they have to plow the roads to keep them open. The photo below shows Margery hiking up a sand dune. Her trekking poles make it look like she is cross-country skiing. In areas where the dunes are moving slowly and in between the dunes, there is vegetation. Those areas reminded us of the North Carolina shore where we visited last fall. Imagine the blue of the mountains in the distance in the photo below is ocean. Although there are 60 varieties of plants that live in the dune field, most are found in the areas between the dunes. Only eight varieties of plants have adapted in ways to allow them to survive in the moving sand. The Rio Grande Cottonwood can survive partially buried in the sand. 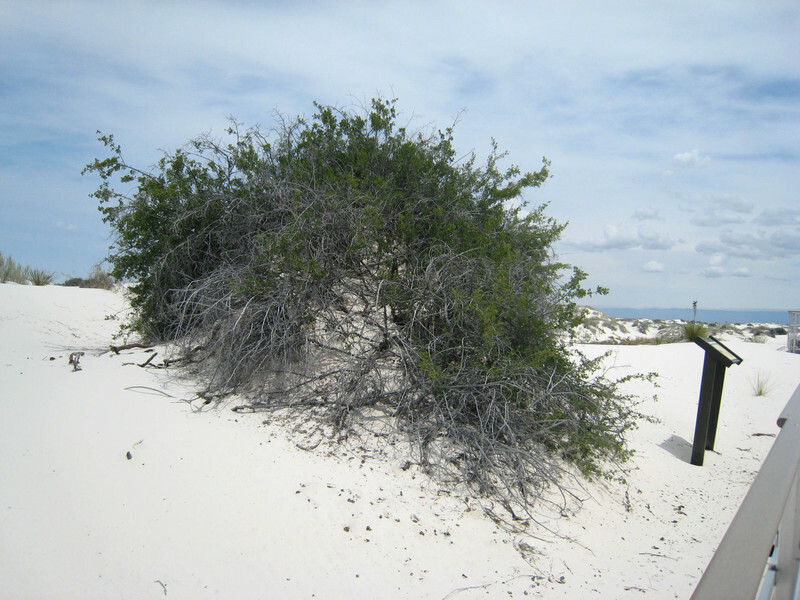 The Soaptree Yucca can grow its main stem rapidly in order to keep its leaves above the level of the sand. However, after the dune passes, the stem will collapse under its own weight and the plant usually dies. Other plants such as the Skunkbush Sumac and the Rosemary Mint grow dense masses of roots that hang onto a clump of sand. The plant will be left standing on a sand pedestal like the one in the photo below. 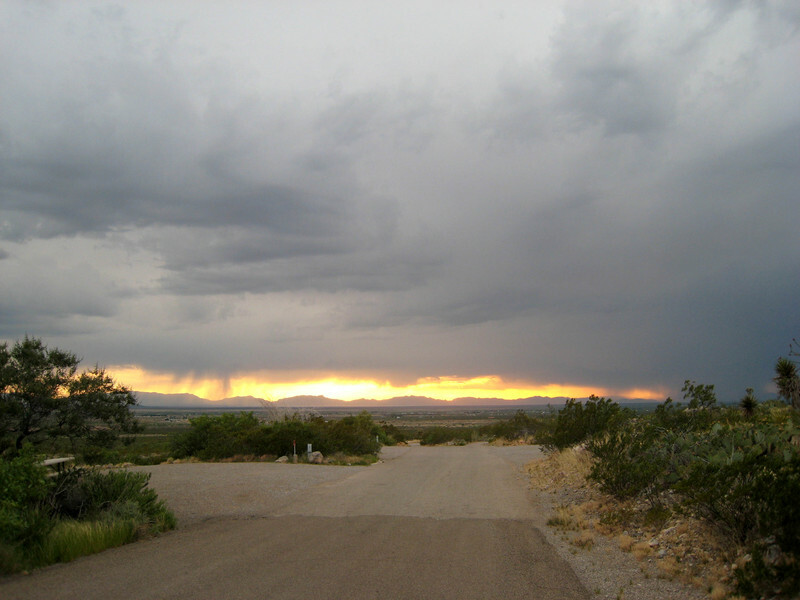 The route from Carlsbad to Alamogordo takes you across the Sacramento Mountains and through the village of Cloudcroft. Unfortunately we missed Cloudcroft on our way into Alamogordo because our computer mapping software took us on a supposedly shorter route. Then, because we missed a turn, we ended up going 50 miles out of our way through the Lincoln National Forest. However, when we checked later to see where we went wrong, we found missing the turn was actually a blessing because the computer route would have probably been too steep and narrow to safely travel in our motor home. ...but since we were dressed in shorts, we didn’t stay very long. We did, however, experience some spectacular views coming back down the mountain. The white streak far in the distance in the photo below is White Sands. We had passed several pistachio farms on our way into Alamogordo, but we decided to visit Eagle Ranch Pistachio Grove because they offered daily tours. Pistachios are native to the Middle East - Iran,Turkey and Afghanistan. In the U.S. they are grown primarily in California, but in 1974 Eagle Ranch Pistachio Grove was started in the Tularosa Basin in New Mexico. The climate and altitude are the same as in Iran and Turkey. 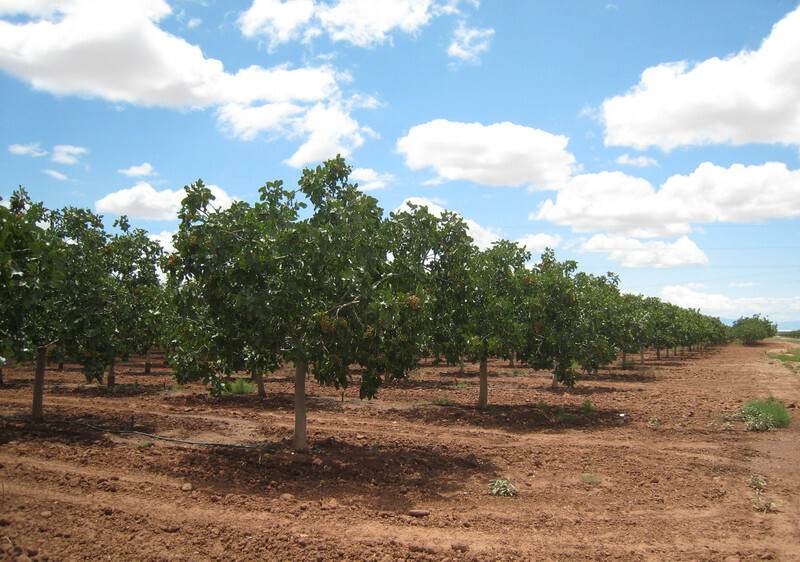 Today, Eagle Ranch has 12,000 pistachio trees. The photo below is a view of part of their grove. Pistachios are harvested in early September. The nuts have an soft outer skin called the epicarp which covers the hard shell. The photo below shows clusters of young pistachios with pinkish epicarp. When the nuts are ripe, the epicarp will turn light tan, and the hard shell underneath will split. Pistachios do not have to be roasted for the shells to open. After initial cleaning to remove the epicarp, the nuts are put into cold storage to be processed later as needed. This makes the tour particularly interesting, because you never know what operations you’ll see. The processes include sorting, flavoring, roasting, and packaging. Eagle Ranch sells flavored (green chili, red chili, lemon-lime, and cinnamon), salted, unsalted, shelled, and in-the-shell pistachios. They are the best pistachios we have ever tasted. We’re not big on visiting gift shops since we downsized to the motor home, but the Eagle Ranch gift shop was particularly nice. While we waited for the tour to begin, we were able to view a video of the pistachio processing. In addition to samples of all their pistachio products and selective gift items which were not your usual souvenir fare, they also offered wine tasting. This summer they plan to build a winery next to their vineyard, which is down the road. Pistachios seem to be an ideal crop. They do not require a lot of space to process or store and they are harvested all at one time and held in cold storage to be processed as needed. 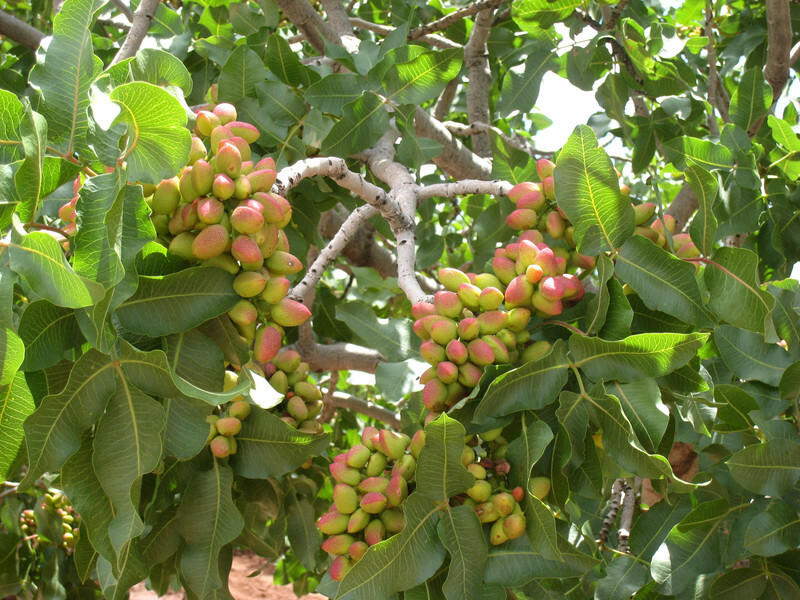 Pistachios don’t need a lot of water and tolerate saline water found in many desert locations. If we ever wanted to start a business (which we don’t), we would want to do it the Eagle Ranch way. We enjoyed our time in Alamogordo but headed further west looking forward to our next stop, Silver City.